Mercedes-Benz’ autonomous ambitions have been pretty clear. It’s the future of luxury and all that. 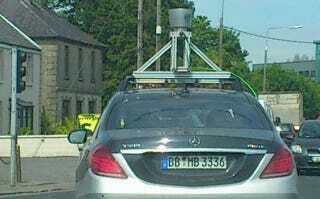 Now Darren, a Jalop reader in western Ireland, caught this prototype S-Class fitted with a massive LIDAR array on its roof. But what the hell is Mercedes doing with it? Most of our sources weren’t sure – or entirely forthcoming – on what was being tested, although there’s no doubt that the next S-Class is going to go big into automated driving when the facelift lands in 2017 and even bigger when the all-new car lands at the end of the decade. Between now and then, we’ve got the E-Class that’s going on sale next year that takes the S-Class’ low-speed auto-steering and ramps it up to 80 MPH on the highway and can handle not-insignificant bends in the road, all while reading the speed limit signs and adjusting accordingly. The E is also set to benefit from a new level of pedestrian and object detection that can either bring the car to a stop from a maximum speed of 40 MPH or even swerve around the object. All these systems use cameras, sensors, and a Cray’s worth of processing power to both interpret and react to the situations. But Mercedes needs more granular data, and that’s where the LIDAR unit comes into play. The LIDAR shoots out over 60 lasers taking over one million readings per second. It maps every single element in its view down to the millimeter, not just keeping tabs on other cars, bicyclists and pedestrians, but medians, curbs, and anything that could be a potential thread. This is how the LIDAR sees the world, but the only way to get that view is to have a massive chunk of machinery spinning on top of the car. Mercedes could be using the LIDAR to begin building its own 3D map as a way to catalog certain roads for research and development. Or it could have a spate of next-generation sensors on board that do something similar to the LIDAR and the unit on the roof is a cross-check on the accuracy of those sensors. But no matter what it’s being used for, it’s going to spell big things for Mercedes’ big sedan.